Hardly Strictly was crowded last year. It's going to be crowded again this year. Come on, it's free. Deal with it. A weekly series on how to have an amazing weekend when you have no money (we’re telling you, it is possible). 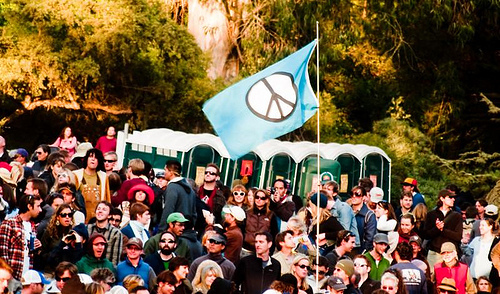 The Hardly Strictly Bluegrass Festival  returns in its 10th glorious iteration to Golden Gate Park all weekend! Check out SFist’s guide on who to see . Tonight, the Del Sol String Quartet  brings their contemporary arrangements to the Berkeley Art Museum as part of their [email protected] series (free w/ a Cal ID). Also, Train is going to be at the Greek (for tips on how to see the show for free – okay, fine, you don’t really see anything this way but you can hear everything – check out the last Weekend Free-view ). Also, believe it or not, a 24-hour Facebook hackathon  is taking place in Soda Hall’s Wozniak Lounge, starting with a tech talk at 5. It’s exactly what it sounds like: a bunch of engineers are spending their Friday night hacking away! There’s going to be an abundance of food, beverages, nerdiness, and the possibility of spectating for those less hacking-inclined. Seeing as how there’s a day of celebration for just about everything, Oct. 2 is 24 Hour Comics Day ; Berkeley’s comic-book haven, Comic Relief , is celebrating . On the festivals-with-narrowly-defined-subjects front, the Watershed Environmental Poetry Festival  will feature readings from environmental-activist-naturalist-poets such as Pulitzer-Prize winning UC Berkeley professor and one-time US Poet Laureate Robert Hass among many others, as well as Barry Finnerty’s Jazz Roots Trio, an open reading, and a Strawberry Creek walk. Also, Arcade Fire  is playing the Greek both this night and Sunday , while You are Plural  is bringing their exquisitely sorrowful indie tunes to the Beehive Market  (mentioned here last week ). In Oakland, the 4th annual Estria Invitational Graffiti Battle  caps off a weekend-long celebration and exploration of graffiti at the Life is Living Festival , while the Castro Street Fair  in SF is sure to be a raucous, festive, and all-around jolly good time as all Castro happenings are when they don’t involve shootings  (of which we heartily disapprove). The theme is “Get Your Freak On” (of which we heartily approve).